Really, thanks goes to the team over at Damonza for their willingness to go through several revisions on the cover. As a designer myself, I can get picky about even minor things. Truth be told, the cover you see is actually the third attempt after their first two didn’t quite capture the feel I wanted for the book. Their design choices in the early stages had a lot to do with the problems I have in marketing this book. Early proofs were very much on a middle-grade / YA line where Crimson Son does not belong. Bright colors and imagery that felt more cartoon than graphic novel. But they were willing to give it another go and we finally ironed out the glitches. Dark and a bit sinister, the cover fits more with the adult themes in Crimson Son. And the much talked about “eyes” were wholly their creation. They don’t at all match the eyes on any of the droids, but their tunneled appearance reflects so much of the other imagery in the book – from some of the psychic intrusions to the final military facility – that they are perfect for the cover. 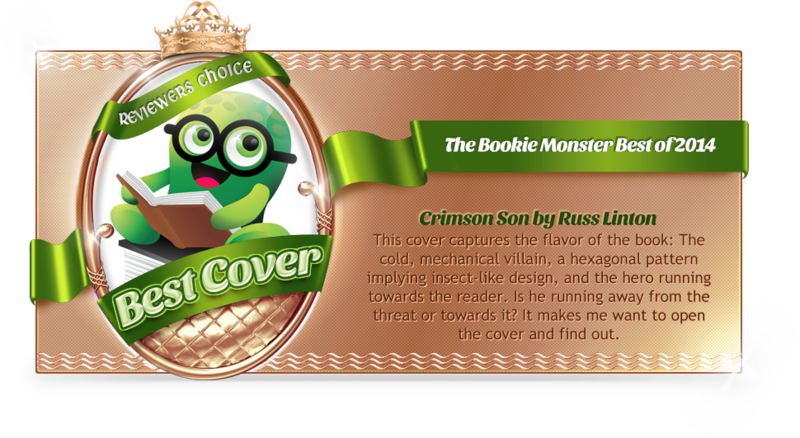 Thanks also to the team at Bookie-Monster for both reviewing Crimson Son and even considering it for this award! If you get a chance, check them out – they’ve built a great team and an impressive fanbase all dedicated to hunting down books worth reading in the horde of words out there.